Known for over 100 years as an innovator of process technologies, Simpson established the Peter L. Simpson Memorial Laboratory in our US headquarters facility in the early 1940’s as a platform for research and performance testing. The Simpson Test Center provides you with a low cost, risk free method to define and optimize your process while utilizing a variety of conditions and machine configurations. Supply of machinery on a rental basis with the support of experienced Simpson engineers for evaluating technologies when material spoilage or the required additional processing and performance measurement equipment requires you to complete the testing in your own plant. Stainless steel Model LG Simpson Mix-Muller (10 liter capacity) equipped with variable speed drive and multiple configurations of mixing tools as well as for heating or cooling or vacuum operation. Model 1-Cell Simpson Even-Flo sand reclaimer including vibrating lump reduction, metallic separation for the testing of foundry sand reclamation. Complete foundry sand laboratory testing capabilities. 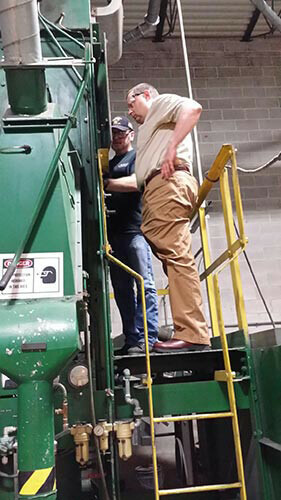 Our goal is to help you more accurately evaluate your process equipment investment–in terms of improved quality, increased production or savings in raw materials, labor and time – and help to minimize the risk in making an investment in new process technology. You are invited to visit our facility for a demonstration of the testing described or to arrange for laboratory tests which can be conducted under your supervision. For more details, please contact sales@simpsongroup.com.